Dashan Wang vs Ginga. 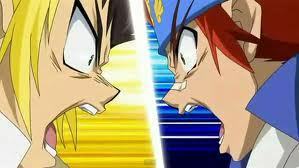 The 4000 साल Old Secret Episode- Ginga faces Dashan Wang to see who will go on in the World Championships. Wallpaper and background images in the बेब्लेड Metal Fusion club tagged: beyblade metal masters ginga. This बेब्लेड Metal Fusion photo might contain मोबाइल फोनों के लिए, हास्य पुस्तक, मंगा, कार्टून, एनीमे, कॉमिक बुक, and manga.